Based on a true incident. If for no other reason check out the illustration. "When did a priest keep an oath?” complained Conan, comprehending the trend of the conversation. “Let me cut his throat; I want to see what color his blood is. They say in the Maze that his heart is black, so his blood must be black too..."
— Robert E. Howard, "Rogues in the House"
The story takes place in an unnamed city-state between Zamora and Corinthia during an apparent power struggle between two powerful leaders: Murilo, an aristocrat, and Nabonidus, the "Red Priest," a clergyman with a strong power base. After he is delivered a subtle threat by Nabonidus, Murilo learns of Conan's reputation as a mercenary and turns to him for help. Last week I decided to apply for a cleaning job someone told me about. Given that my work as a writer has recently slowed down, I was eager at the prospect of some extra income. Cleaning might be just the right sort of part-time job for me, I thought, since I could listen to audio books and courses while I worked. It would essentially mean that I could be paid to do the thing I loved most of all: listen to courses and audio books! Thus it was that last Saturday I excitedly made my way to a spot in downtown Coeur d’Alene where I had arranged to be interviewed for a cleaning job. All I had been told is that I should meet a man named Igor, who organized janitorial crews for companies and had been having difficulty finding workers for one of his corporate clients. As I approached the place I was supposed to rendezvous with Igor, my heart sank: it was in the worst part of town—the part of Coeur d’Alene where respectable people never venture. Coeur d’Alene has a law against loitering, but in this area the law was apparently not being enforced. A crowd of desolates and drunks eyed me suspiciously as I approach Igor’s office. Reading "A Time for Trumpets" on the Battle of the Bulge. I had read this a long time ago but picked it up cheap on the Kindle so giving it another go. Very good read in my opinion. Read it long ago, your right, it's good, very good. Sacha Black makes a great point in the opening of this book - that a villain is at least as important as the hero and rarely gets an equivalent amount of attention as a book is crafted. And we all love a great villain, whether we know it or not, because a great villain makes our hero miserable, which promises a satisfying payoff when the hero prevails! Black is thorough, elaborating on 13 different factors related specifically to villain development, though many of the points, including those covering motivation, conflict, and authenticity, apply to all characters. Villain-specific chapters address such things as female villains, cliches, the villain psyche, and anti-heroes. There is a thoughtful chapter on mental health challenges in relation to building a villain's profile. In general, Black's presentation is a hoot, witty and conversational, and a joy to read. The book is well-organized with summaries at the end of each chapter and references and appendices in the back. Once read, the book can easily serve as an ongoing resource. 13 Steps to Evil is a must-read for new writers and has some good reminders/tips for seasoned writers as well. It gets 4 to 5 stars from women readers on Amazon. Maybe us lonely guys need to read and see what women wants in a man. Highly recommended ... and very different take on the "who caused WWI?" debate ... and the Russian foreign minsiter Sazonov plays center stage. Feeling stomped on, even duped by his peers during the earlier Balkan crisis, he gets his "revenge" in 1914 and changes the world. A fascinating story and again quite in opposition to the conventional wisdom that "The Krauts Did It". Certainly everyone was playing but Sazonov was the quarterback, even if probably unwittingly, at least in terms of the final result. I first read about this idea in Massie's Dreadnought ... but it is worth reading Sean McMeekin's book directly to get the full story. I couldn't put it down. 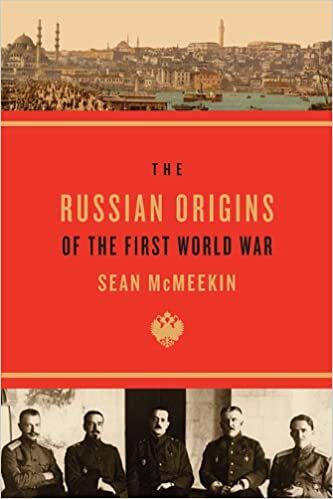 McKeenin weaves in all the players in Austria, Serbia, Russia, France, Germany and Britain, and even includes their backgrounds and motivations. A fast and great read and only $12 on Kindle. McKeein, Scott, "July 1914 - Countdown to War", Basic Books, 1913. Company Commander is good book, a good read. And can also warmly recommend three other books: By Tank into Normandy by Stuart Hills, Recon Scout by Fred H. Salter and Parachute Infantry by David Kenyon Webster. And then a ton of good books that you can not read.